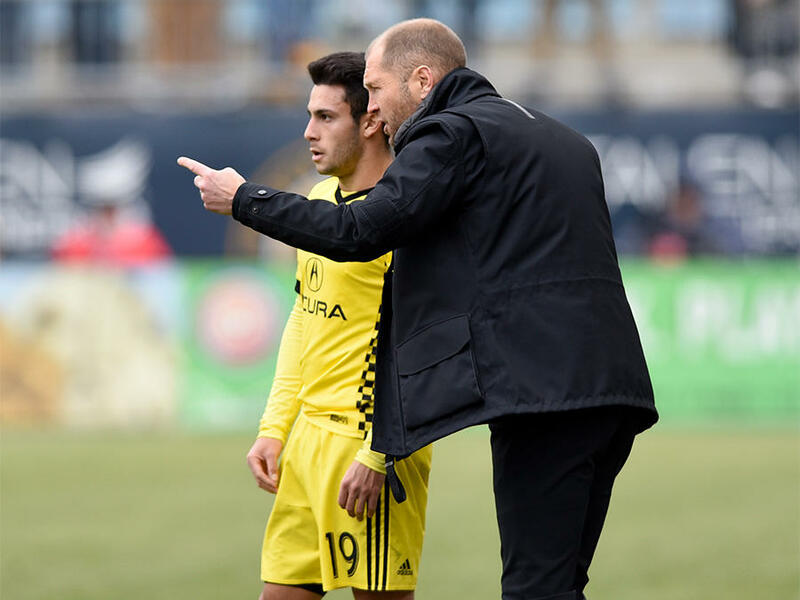 Columbus Crew coach Gregg Berhalter talks with Milton Valenzuela (19) during a break in play of an MLS soccer match against the Philadelphia Union on March 17, 2017, in Chester, Pa.
Gregg Berhalter was hired Sunday to coach the U.S. men’s national team, making him the first person to run the Americans after playing for them at the World Cup. 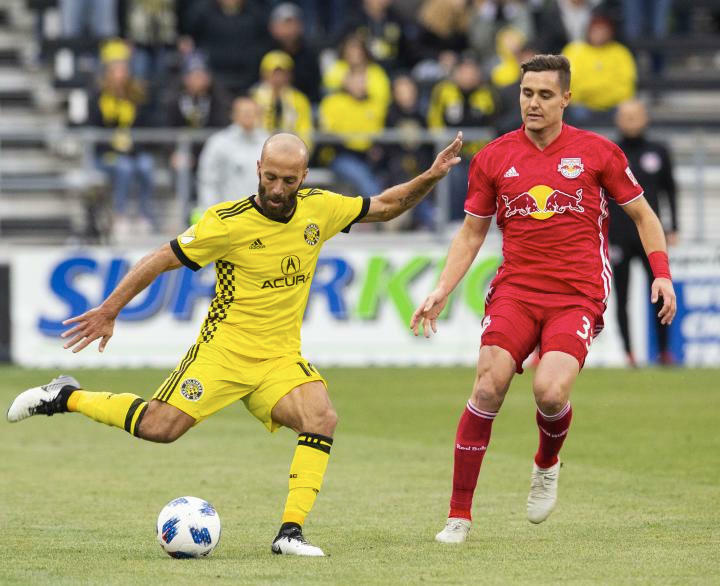 Berhalter, who spent the past five seasons as coach of Major League Soccer’s Columbus Crew, represents a generational change for an American team staggered by its failure to reach this year’s World Cup after seven straight appearances at soccer’s showcase. A native of Englewood, New Jersey, Berhalter grew up in Tenafly and played alongside future U.S. captain Claudio Reyna at Saint Benedict’s Prep in Newark. Berhalter’s Columbus teams succeeded despite one of the league’s lowest payrolls. The 45-year-old was long viewed as the front-runner for a job that stayed open for nearly 14 months. He is the second youngest coach for the Americans in four decades; Steve Sampson was 38 when he took over in 1995. Berhalter is a godson of baseball Hall of Famer Carl Yastrzemski. His 47-year-old brother, Jay, is the U.S. Soccer Federation’s chief commercial and strategy officer. A defender who made 44 appearances for the U.S. from 1994-06, Gregg Berhalter started on the left side of a three-man back line in the 2002 knockout stage matches against Mexico and Germany after Jeff Agoos got hurt and U.S. coach Bruce Arena changed formation. In the 1-0 quarterfinal loss to Germany, Berhalter’s 49th-minute shot bounced off goalkeeper Oliver Kahn and the left arm of German defender Torsten Frings, but Scottish referee Hugh Dallas did not award a penalty kick. Ten minutes earlier, Michael Ballack outjumped Berhalter and Tony Sanneh to head Christian Ziege’s free kick past Brad Friedel. Berhalter was a late addition to the 2006 World Cup roster after Cory Gibbs injured a knee in a pre-tournament exhibition against Morocco, but Berhalter did not get into a World Cup match that year. He also was on the roster for the 1995 Copa America, 1998 CONCACAF Gold Cup and the 1999 and 2003 Confederations Cups. He played college soccer at North Carolina. Months after the U.S. hosted the 1994 World Cup, Belhalter made his national team debut that October in an exhibition at Saudi Arabia. Berhalter played at the club level with Zwolle (1994-96), Sparta Rotterdam (1996-98), Cambuur Leeuwarden (1998-00), Crystal Palace (2001-02), Energie Cottbus (2002-06), 1860 Munich (2006-09) and the LA Galaxy (2009-11). Berhalter started his coaching career at second-division Hammarby in Sweden in December 2011 and was fired in July 2013. Berhalter was hired by Columbus in November 2013 and led the team to third, second, ninth and consecutive fifth-place finishes. The low-budget Crew lost to Portland in the 2015 MLS final and to Toronto in the 2017 Eastern Conference final. Arena replaced Jurgen Klinsmann in November 2016 after a 0-2 start in the final round of World Cup qualifying. The Americans fell one point short of the tournament when they lost 2-1 at Trinidad and Tobago on Oct. 10, 2017, and Arena quit three days later. A search was delayed until after the USSF presidential election. After Carlos Cordeiro was voted in to succeed Sunil Gulati in February, the USSF board decided to institute a men’s national team general manager to head the search. Stewart, a former Berhalter teammate on the national team, was hired in June but didn’t start until mid-August because of his obligations to the Philadelphia Union, further delaying the search. Stewart consulted with eight Americans with 100 international appearances, then worked with USSF chief sport development officer Nico Romeijn and chief soccer officer Ryan Mooney to develop a five-page job description. It included 10 base value qualifications such as implementing a recognizable style and understanding analytics, and six with added value such as multiple languages. Stewart compiled a list of 33 candidates, narrowed it to 11 and interviewed two: Oscar Pareja, who left FC Dallas last month for Mexico’s Tijuana, and Berhalter. “His willingness, work ethic and ideas about developing this player pool and influencing these players in and outside of camp and the thought process he has about that — constantly seeking new things — set him apart,” Stewart said. Dave Sarachan, Arena’s top assistant, has coached the team in the interim. The Americans won three, lost five and tied four as 23 players made their debuts, including Weston McKennie, Tyler Adams, Tim Weah, Josh Sargent and Cameron-Carter Vickers. Berhalter’s first games will be a pair of exhibitions following a January training camp that will lack most Europe-based players. His first significant test will be at the CONCACAF Gold Cup, where the defending champion U.S. opens on June 18. He must decide how to integrate the new group with veterans who may prove useful during qualifying for the 2022 World Cup, such the 34-year-old Guzan, 31-year-old midfielder Michael Bradley and 28-year-old forward Jozy Altidore. CONCACAF has not said when qualifying for the 2022 World Cup will start. 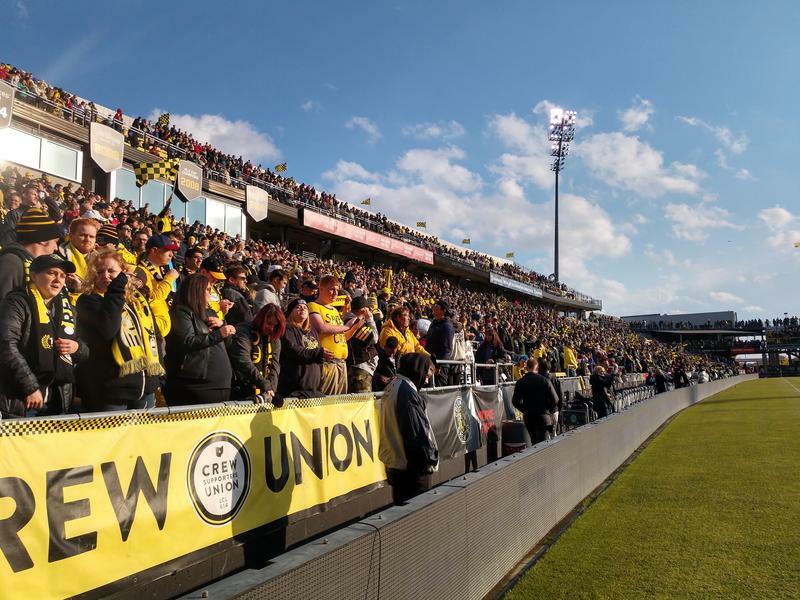 Columbus Crew SC fans decked out in black and bright yellow clothing and face paint packed the stands of MAPFRE Stadium late Sunday afternoon. Even a severe weather game delay couldn’t keep away spectators, who cheered the team onto a 3-2 victory against Minnesota United FC. 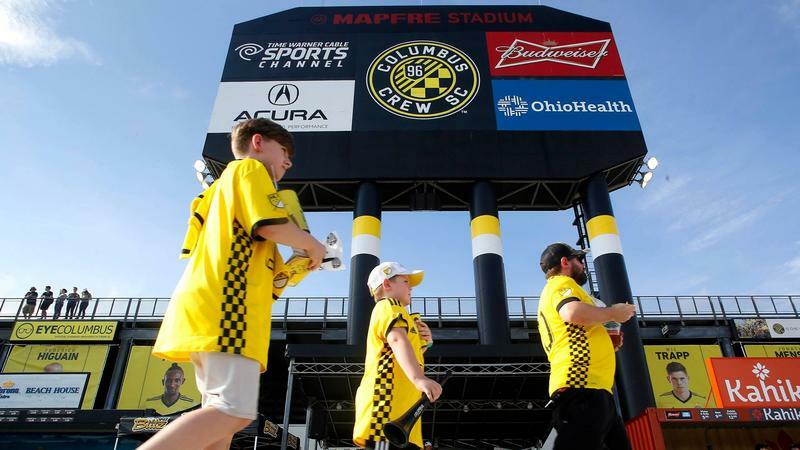 Major League Soccer announced last week that the league wanted to keep the Columbus Crew SC in Columbus. The plan involves a major investor groups interested in buying the team. A year ago today, when Crew owner Anthony Precourt announced his plan to move the club to Austin, Crew fans were crestfallen and angry. Now, they are jubilant. But nothing’s official yet. Today on All Sides, the future of the Columbus Crew. Does Keeping Columbus Crew Mean Building A New Stadium? Fans cheered inside Endeavor Brewing on Friday after hearing the news that Cleveland Brown owners Jimmy and Dee Haslam were making progress on a deal to keep the Crew in Columbus. But those negotiations hinge on whether city and team officials can nail down a deal on a new stadium.